Dr. Rob Allen is a dentist in Raleigh whose initial attraction to dentistry was its ability to improve people’s lives. Additionally, dentistry allows him to express his artistic side by providing a unique blend of science and art to restore smiles with aesthetics in mind. While there are numerous dentists in Raleigh, Dr. Allen’s conservative treatment approach sets him apart. While he eagerly embraces new dental technologies that provide better care, Dr. Allen also hangs onto a traditional notion of taking patient desires into account and doing what is in each person’s best interest when developing a treatment plan. There is no snapshot dentistry practiced in his office. This means that to address the dental issue at hand, he considers the long-term consequences and health of the patient as well. 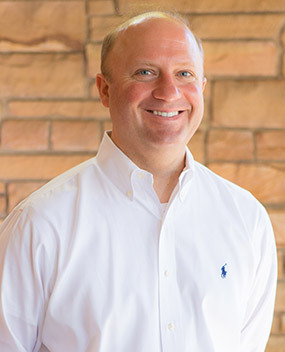 Our patients frequently tell us they choose our practice because Dr. Allen is personal and he develops meaningful connections with them, in addition to properly addressing their dental concerns. He enjoys getting to know patients, their families, and learning a bit about them. Dr. Allen attended North Carolina State University where he earned bachelor’s degrees in biochemistry and chemistry, and minored in English. He went on to graduate with honors from the University of North Carolina at Chapel Hill School of Dentistry in 1999. He has held the position of adjunct instructor at the UNC School of Dentistry. After college, Dr. Allen chose to complete a yearlong general practice residency at Carolinas Medical Center in Charlotte, rather than immediately going into private practice to expand and get a broader base of knowledge prior to working with the public. This residency provided a wide range of experience in dental trauma cases and other complicated treatment issues. He gained experience in treating the patient as a whole, rather than just addressing dental issues, which prepared him well for private practice. He accepted an associate position in a large group dental practice in 2000, and left there in 2003 to open his own office in early 2004. Dr. Allen and his wife Jennifer have been married since 1997. They have two golden retrievers. When he isn’t working, Dr. Allen enjoys hiking, fishing, birding and generally anything outdoors enjoying nature.